As the Baby Boomer generation ages, the number of aging adults needing treatment for a variety of substance use disorders continues to expand and now includes a strong emphasis on addiction to prescription medications. In this course, you will learn to screen, assess, and diagnose substance use disorders in an aging population of adults. You will also review specific issues that complicate the diagnosis of substance use disorders in older adults. Specifically, this training covers risk and protective factors, the effects of aging on patterns of drinking, patterns of medication use, and physiological changes as we age, as well as how those changes impact the development and treatment of Substance Use Disorders. The course focuses entirely on screening, assessment, and diagnostic features of substance use disorders in an aging population. However, this course does not provide training in the evidence-based treatments shown to be effective with this population. DSM™ and DSM-5™ are registered trademarks of the American Psychiatric Association. The American Psychiatric Association is not affiliated with nor endorses this course. Identify the numerous health and wellness problems related to substance use disorders in older adults. 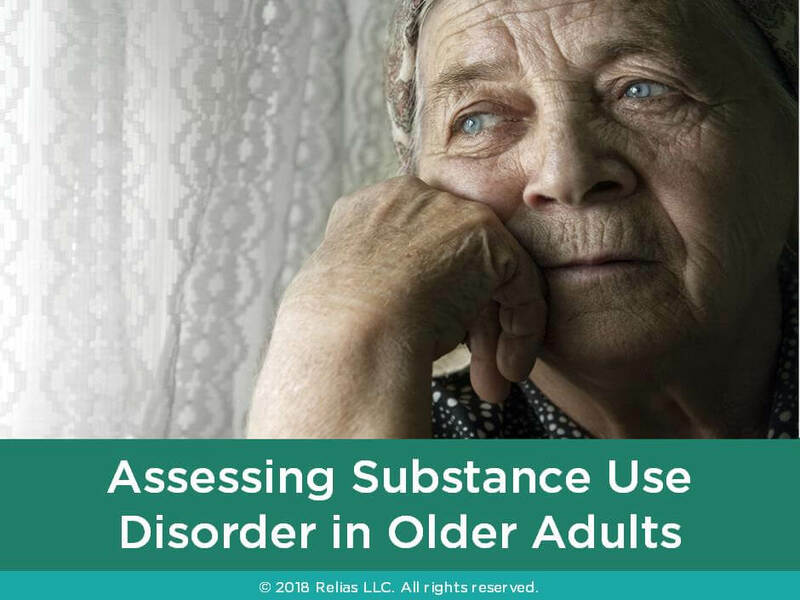 Be aware of the most appropriate diagnostic information, screening tools, and assessment methods typically used when working with substance abuse in older adults. Identify co-occurring substance use and mental health concerns when assessing and diagnosing older persons with substance use disorders. The target audience for this course is: entry level Psychologists; intermediate level Alcohol and Drug Counselors; intermediate level Marriage and Family Therapists; intermediate level Professional Counselors; intermediate level Social Workers; Nurses; in the following settings: Health and Human Services.